As the sun sets in District 5’s Cho Lon area, better known as “Chinatown,” businesses pull up the welcome mats and once bustling storefronts fade into the darkness. This isn’t to say that that the sidewalks completely roll up though. The food carts and streetside eateries begin to appear out of the woodwork, and a whole new side of this area opens up to exploration. Daytime in this most non-Chinese of Chinatowns may nourish the imagination, but nighttime is like chicken soup for the soul to borrow a well known book’s title. And chicken soup is actually what I tried. Though I have silently vowed to never eat Vietnamese chicken again before hell freezes over, I broke down and gave a bowl of miến gà. Down a side alley at 904/3 Nguyen Trai a large metal table sprawls in front of a pastel green concrete building. This color would actually be at home in Miami Beach, and I looked around for a pink flamingo or two. A guy hacking chicken on a wooden cutting board within inches of people eating snapped me back to Saigon, and this gritty neighborhood is definitely not the type to display any such kitsch. The entire alleyway scene mesmerized me with its tentacles so seductively that before I knew it, I was squatting on a tiny metal stool so low to the ground my knees were almost tucked up under my chin. A man a few stools down kept shouting “Lot Anyelet” over and over and after a while I realized he was asking if I come from Los Angeles. No matter where in the world I go, everyone always knows Los Angeles and assumes I must come from there since evidently the United States ends just east of LA County. Various baskets of dried noodles match up with names on the menu and I randomly chose the miến. 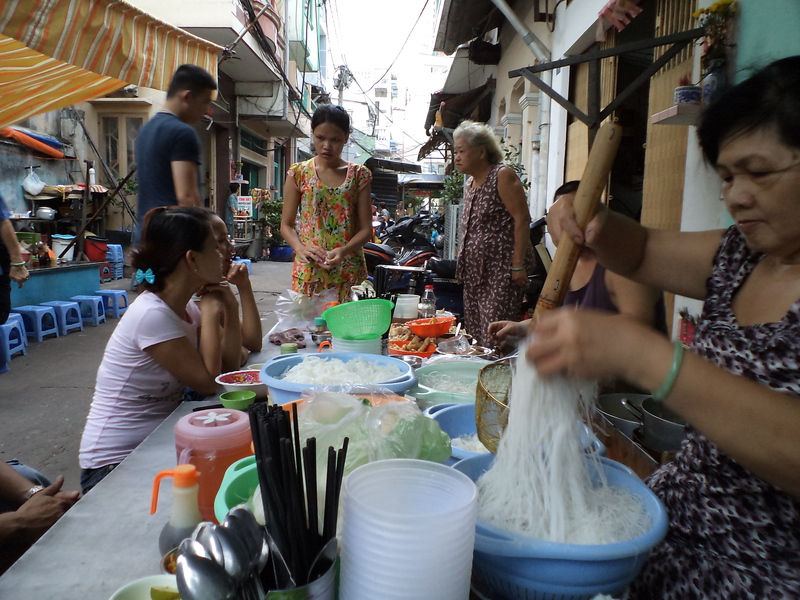 Lady Luck accompanied the bowl of soup from the pot to my perch and miến turned out to be glass noodles. These clear stands clumped together in the bottom of the bowl like a jellyfish, but appearances can be deceiving. They truly are a good neutral candidate to mop of the surrounding flavors such as a broth fairly reminiscent of the won ton soup we enjoy in the US. A small splash of hot chili sauce set the whole bowl ablaze, and my lips soon went numb. Now that’s how food should be eaten! That man’s cleaver skillfully leaves behind all the fat, bone, and gristle and all that’s left is highly edible strips of tender, moist bird. Amazing! Why can’t other chicken soup joints follow this place’s lead? A sign board displays the words “Lu Ky” in bold black letters and though I have no idea what they mean in English, I sure did get to thinking how lucky I was my leap of faith paid off in the end. 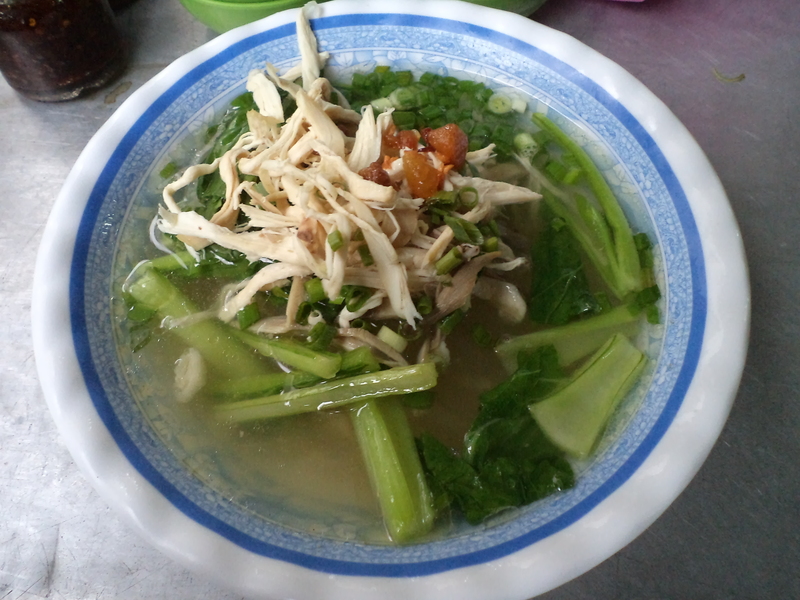 This chicken and glass noodle soup was great. The chicken was great. The whole experience was great. I can’t believe it. Chicken in Vietnam I can eat. Hell has frozen over. Leave it to Chinatown to deliver.